Do you have LED tail/brake lights? 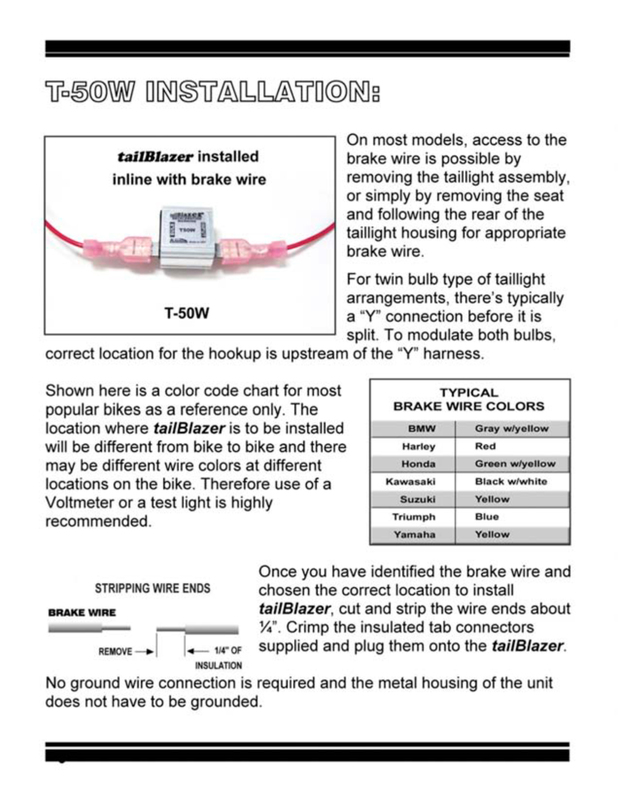 For Automotive 3rd brake-light use? 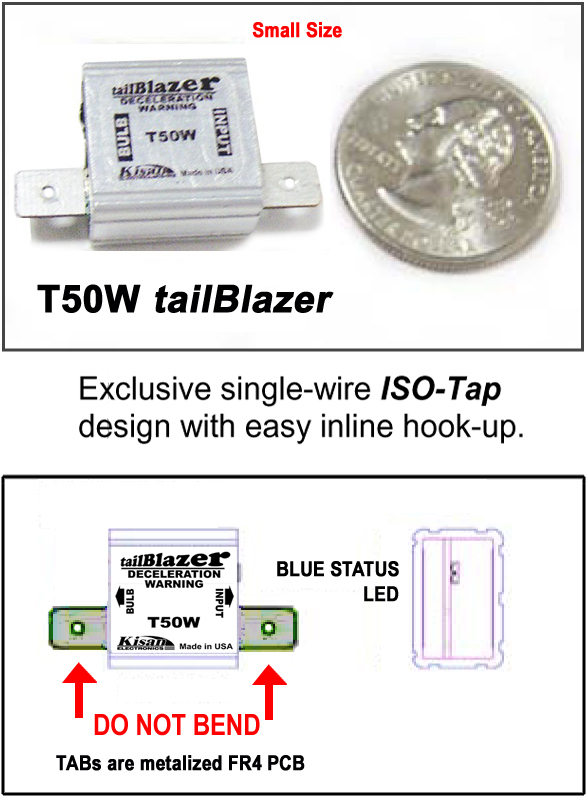 T50W unit is designed to handle up to (2) tail light bulbs - for most Harleys, Honda, Suzuki, Yamaha, Kawasaki cruiser models, with specific application for newer BMWs with 3-wire LED taillights and Honda Goldwing LED spoilers with dual-row LEDs. 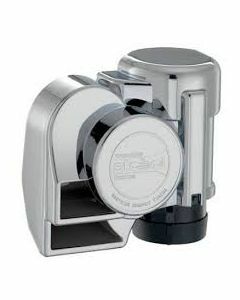 T50WD unit is very compact - only 0.6" (15mm) square. It can fit in the tail section or under the seat or even behind the tail light housing. When you apply the brakes the brake light will modulate rapidly at first then slow down to a solid ON, over a period of (4) seconds. Simply flashing brake lights or flashing them on & off will get the attention of drivers behind you, but it doesn't inform them of anything else. 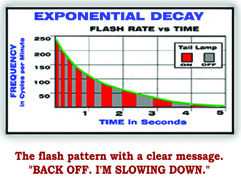 Every split second of delay in their reaction reduces your safety margin. ■ Install it inline with the brake wire, as shown. 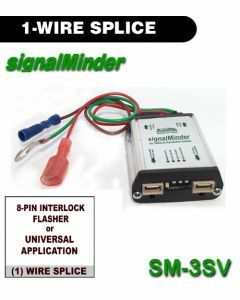 No ground wire or ground connection required! ■ If it's hooked-up the wrong way, the circuit shuts down and the Status LED flashes rapidly. 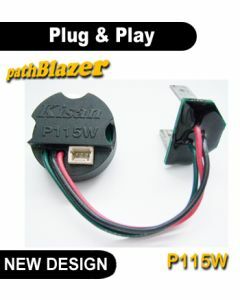 ■ If there's a short or if the load is more than 50W, the circuit shuts down. Just like a fuse. The Satus LED stays off. You can reset the unit after the short or the overload is removed. 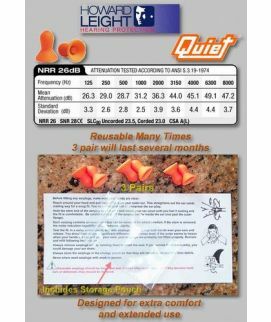 ■ DO NOT use on bikes that have bulb-check system or CAN-bus monitoring. 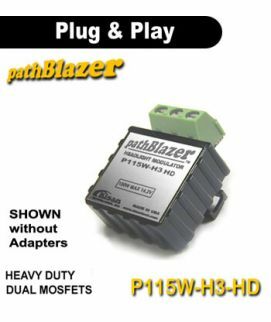 ■ DO NOT use on LED clusters that share tail & brake inputs.